You'll be £10.39 closer to your next £10.00 credit when you purchase Women's Suffrage in Scotland. What's this? Order within the next 9 hours, 12 minutes to get your order processed the next working day! A lively exploration into the determined Scottish women of the predominantly Victorian and Edwardian periods. Their fight and determination for gender equality to achieve votes for women in a male dominated society. Discover some of the antics these women embarked on, and judge for yourself if they were too militant! What tragedies they were dealt, and the friendships that developed! Explore individual areas of Scotland’s landscape and journey through the cities and towns, and observe the secrets and shame of how women were often treated, at home, in educational establishments, workplace and by the law. Learn why the women fought against the system through the years. They suffered immense hardship, but was this the beginning of courageous and strong Scottish women fighting for what they believed in, and onwards to suffrage. Accounts from individual families of Scottish suffragettes and suffragists with photographs from their own albums that shed light on how women were perceived by the family members, men, and the nation. Comments made by certain politicians of the time were often venomous! 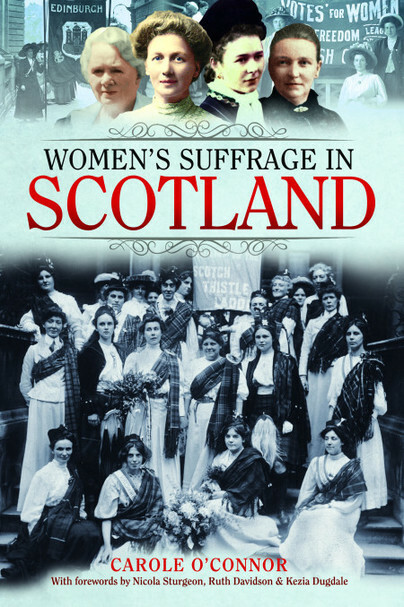 Uncover what methods of achieving suffrage these powerful Scottish women went through. Learn from family histories, of not just upper and middle class females defiant for the cause, but many working class women who stood proudly with them. Women’s Suffrage in Scotland seeks to understand the rights and beliefs of the women of Scotland, and their role in the path to women’s enfranchisement. Carole O’Connor is a professional freelance writer with published articles in various magazines and local newspapers. Time as a reporter on a local paper confirmed to her that feature writing was her chosen writing pathway, and her career as a qualified nurse equipped her with great communication skills and thirst for knowledge; helpful for writing. She also achieved a distinction in Journalism during a career break, as a ‘mature’ student! A hunger for history from school days, and a passion for research, led her to gravitate towards writing about Scottish suffrage.